Chocolate Diamonds : What are they and how much do they cost? With a delicious rich brown color and an elegant sparkle, chocolate diamonds are exactly like the sweet that gave their name – absolutely irresistible. We know you are used to diamonds being clear, but you have probably heard of chocolate diamonds as well. Are they natural? Are they very expensive? These are questions that every woman asks when thinking of buying precious or semi precious stone jewelry. But you have to read further to find out. In this article, you will discover everything you need to know about chocolate diamonds as well as what to look for when buying one. To answer the first question, chocolate diamonds are natural, just like champagne or canary diamonds. In fact, colored diamonds are far more common than clear ones. Well, except for the red diamond which we know is that rarest gemstone on Earth. But other than that, pink, blue, orange, green or even brown diamonds are more common than clear ones. Now that we got that out of our way, you need to understand how chocolate diamonds get their color. They form very deep inside the Earth crust under really high pressure which causes them to darken. This is how all varieties of brown diamonds get their shades. Of course, besides the natural variety, you can also find diamonds that have received a treatment for their color. However, since colorless diamonds are more expensive than colored ones, it wouldn’t be profitable to treat a clear diamond and make it brown, for example. The color treatment usually has the purpose to intensify the hue of an already colored diamond. Where do chocolate diamonds come from? There are a couple of locations on Earth where people mine colored diamonds. It is very interesting to know that each of these locations offers a certain color. In Northern Asia, for example, people mine purple diamonds which they cannot find elsewhere. In Southern Asia, you can find blue diamonds, while in Australia there are the main mines for pink diamonds. While green diamonds are extremely rare, they have been discovered in Southern America. South Africa is rich in diamonds and the mines in this region offer canary diamonds, as well as blue ones. 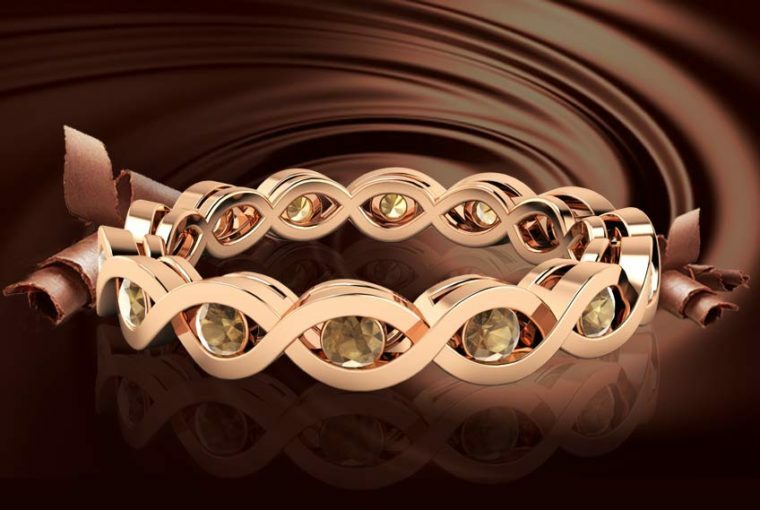 When it comes to brown diamonds specifically, including the chocolate variety, these usually come from several regions. Angola offers a small portion of chocolate diamonds but specializes in colorless ones. Borneo, on the other hand, is a primary source of brown diamonds, as well as Brazil. Another location where people mine brown diamonds is Congo and last, but not least, there is the famous Argyle mine in Australia. However, as long as Argyle is concerned, even though it offers a large portion of champagne diamonds, people know it for the ultra-rare varieties: red and pink diamonds. Are chocolate diamonds the same as champagne diamonds? Well, technically yes and no. You see, the term “chocolate diamond” is a marketing phrase that belongs to a jewelry manufacturer. It does not necessarily refer to the color, but rather to specific products. However, if you look closely at a chocolate and a champagne diamond, you may notice that the first one has a deeper brown color. From there on it is a matter of preference whether you choose to buy chocolate diamonds or champagne ones. One aspect you really need to consider is the clarity of the diamond. It doesn’t matter whether you are buying colorless or chocolate diamonds. The clarity of the diamond shows you how many inclusions the gemstone has. And, as you know, too many inclusions cause the diamond to lose part of its brilliance. It is easier to assess the clarity of a colorless diamond, but it doesn’t mean that you can’t do it for chocolate diamonds as well. You just have to make sure you assess the diamond in a well-lit setting and pay attention to how it reacts to light. How much do chocolate diamonds cost? 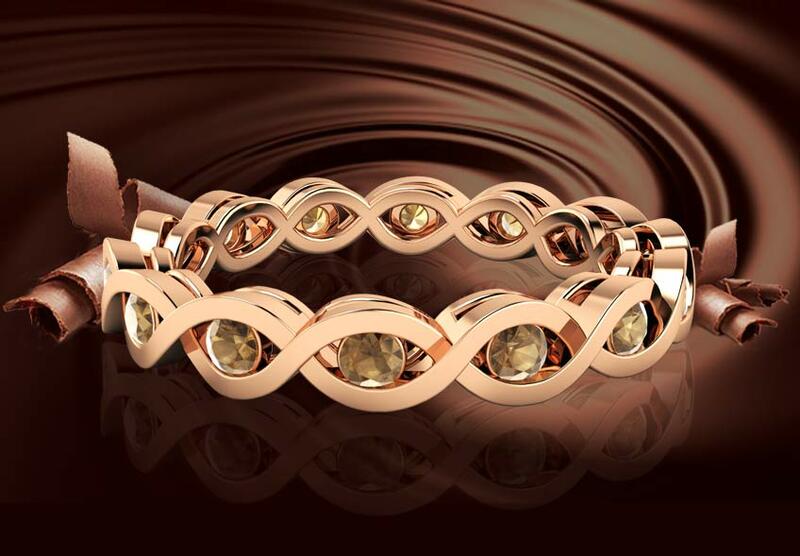 When comparing chocolate diamonds to clear ones, you will notice that the prices differ a lot. While a clear diamond can cost between $4,500 and $6,000 per carat, a chocolate diamond will be less than $1,000 per carat. Even though more affordable than other types of diamonds, chocolate diamonds are a good investment. They have the same extraordinary durability as all diamonds and can look gorgeous in jewelry. What you have to remember, though, is that because of their specific color, chocolate diamonds look extra-elegant in silvery-white settings like platinum. If you liked expanding your diamond knowledge, then read our other articles as well. You will find the most interesting information related to jewelry on this blog, as well as fashion & style tips. To view our unique fine jewelry collections, please visit Ana Luisa online jewelry shop. Get to see our limited-edition designer creations and choose your next favorite jewelry piece.